No oil is used as this therapy is done through light clothing. Some people find the more upright position helpful, particularly if they have lower back issues. 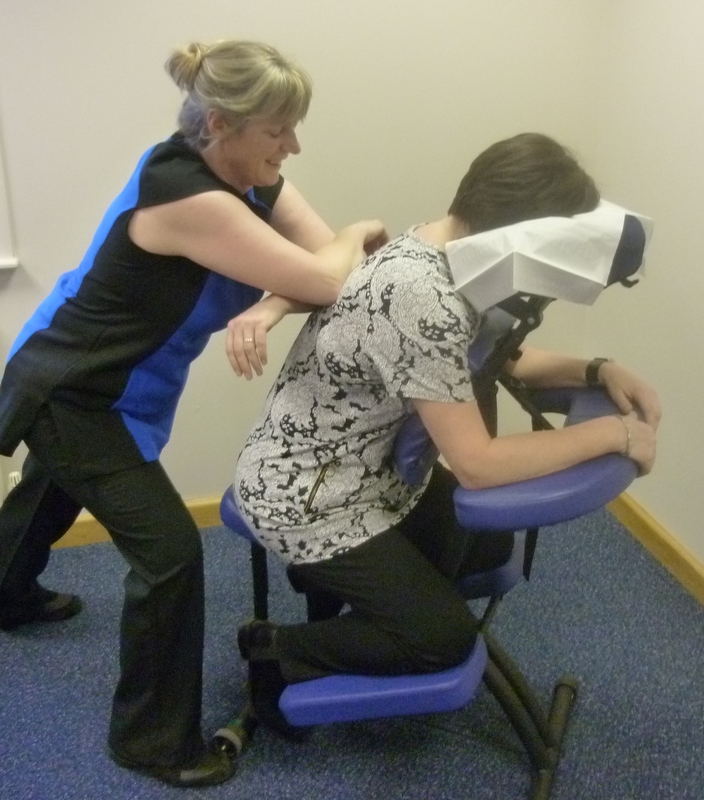 Chair Massage is ideal for anyone with a desk or driving job. Hayley employs many techniques including use of the forearm which ensure a comfortable, yet deep and effective soft tissue massage. Spreading the pressure over a larger area literally squashes the tension out of the muscles. Hayley also uses a variety of helpful massage tools too, e.g. tennis ball and squash ball and gives clients self help tips on how to help tension day to day. Stress-reducing endorphins and other mood enhancing chemicals are released within the body to help one feel more positive and give a feeling of well-being. At Hayley’s studio in Belton the chair massage therapy is 45 minutes long. Chair Massage is adapted to your needs and covers the back, shoulders and neck and may also include work on arms and scalp if needed in order to addresses all areas holding tension. Sit there and let your stresses float away! R E L A X and ‘Chill Out’. For information on this therapy in a clinic either at the workplace or other premises please see Chair Massage Clinics. It is also an ideal on-site therapy for horse riders see Horse & Rider Packages and Clinics.